Clark County, WA. and Multnomah County OR. Note: The information and recommendations below are informational only. Please consult with your Doctor before implementing anything you might learn here. Clark County Public Health has been investigating this outbreak since January 1, 2019. They have now confirmed 30 cases.It is likely that cases will occur in Multnomah County during the outbreak. Please visit their announcement here to get the details of where those with the measles were known to have traveled or visited. Where can I find out more about the Measles and the MMR vaccine? The public interest group Physicians For Informed Consent organization has put out an informative “Measles –Disease Information Statement(DIS)” that is available here. There is also a document on the website regarding MMR vaccine that compares the safety of that vaccine to the danger of the disease of measles. The recommendation of the CDC and the county and state health experts is to get the MMR vaccine. So far the majority of cases in this outbreak are in individuals who have not received the vaccination. This article can help explain the limits of the measles vaccine and how vaccinated individuals have been documented to be able to become infected and spread it to others. The following recommendations are applicable regardless of vaccination status. Again –this is for informational purposes only please consult your physician, if that is one of our doctors, please schedule an appointment to address your needs. If you have a personal or family history of adverse reactions to the MMR or other reasons that make you think you don’t want your child to have the MMR, we recommend you keep your child home and away from public places until this outbreak is confirmed to be over. This time of year we typically recommend taking Immune Support Food Concentrates in the form of Congaplex (chewable for kids) or Immuno-Plus and Vitamin D. All of these support immune function and help prevent respiratory infection. With the outbreak consider starting our herbal combination Anti-Viral Drops and vitamin A drops on a regular basis as well. If you need advice specific to your child or your family history please contact the front desk to schedule an appointment. During infectious outbreaks oral dilutions of the viral agent can be given in homeopathic form. This is called Homeopathic Prevention or Homeoprophylaxis. For measles the Homeoprophylaxis medicine is Morbillinum. The effect of these is similar in principle to oral vaccination. They are a dilute oral exposure to the killed virus. MMR contains a weakened live virus. The principle difference is that there are no heavy metals, adjuvants, preservatives, or other chemicals in the homeopathic oral form. These are available to our patients by prescription and require a short visit in order to prescribe and dispense. They can also be used as a medicine during the infection itself to stimulate the immune system to clear the infection. Homeoprophylaxis is not considered by the CDC, county, or state health authorities to be a substitute for vaccinations. For more about this method, it’s history, and clinical documentation and research about its’ effectiveness here are 1,2, and 3 articles with more information. 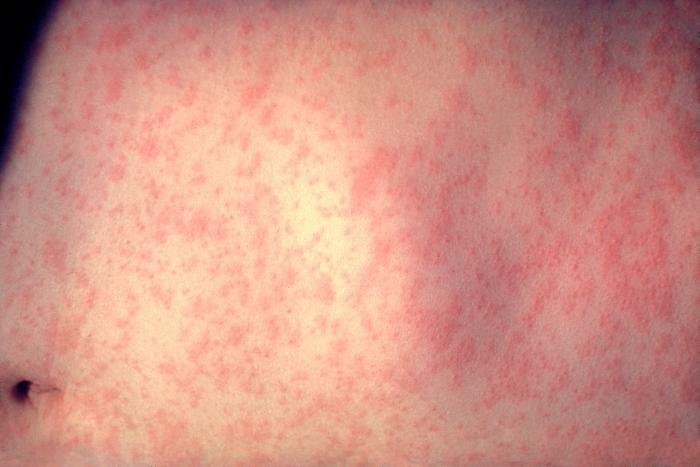 What to do if you think you or your child has been exposed or has measles? Because measles is highly contagious this is one of the rare times that we do NOT want you to bring them to the clinic for examination and treatment right away. Instead please contact the office and we will set up a telephone consultation to evaluate and discuss treatment options. Let them know you are worried they may have measles –sothey can arrange to speak and not to expose the clinic.At the onset of any respiratory infection please see our Fever and Infection Guidelines which will outline the immune support protocols that help the body fight and clear infections from the beginning. High dose vitamin A has been studied and used in measles outbreaks worldwide to reduce complications and save lives. This is primarily in areas suffering malnutrition. What would Dr. Blake do for his family to prevent and if needed treat the measles? Take Vitamin A at a high dose for 2 days. Vitamin A is fat soluble and stored by the body –so this raises the levels to allow for a vigorous immune response over the coming month. Antiviral drops (herbal tincture)-1 tspn daily for prevention. Congaplex Chewable-3 to 6 tablets daily (immune nutrients)for prevention.Vitamin D –10,000 iu weekly for prevention. All of the above help to protect against viral and bacterial diseases that are circulating this time of year as well. Morbillinum Homeoprophylaxis –to specifically prepare the immune system to prevent the measles and reduce the severity of the measles if exposed.Follow the guidelines outlined in Fever and Infection Guidelines for all infections. The above recommendations are informational only. Please consult with your doctor before implementing anything you might learn here.